In “The Wasp’s Nest: Book I of the Wasp Chronicles” by C.R. Norris a group of high school band students, sharply dressed in their band uniforms, suddenly find their world shifting as they are sucked through a rift in time. This rift takes them far ahead into the future where everything is different and this isn’t a good kind of different. Along with having to adjust being suddenly pulled away from everything dear to them, the teens also have to fight to survive in this hostile world. Initially, their uniforms cause them to be mistaken for soldiers from an enemy camp. This makes for some tense situations, as they find themselves being chased by new enemies and strange, hungry creatures. Chris is a very resourceful young woman who soon finds herself in training to be a soldier, in a place known as Tojoba, with a group called the Taders. Chris quickly learns to overcome her desire to be defiant and focuses on becoming a skilled soldier. She also develops some new intense relationships. When she graduates from this program, she finds herself off on more adventures. This includes an important assignment to deliver a very special object. This assignment will take the reader into the second story in this series, which means that the suspense will continue. Bruce, another survivor in the group of the rift travelers finds himself not doing so well when he is rejected for soldier training by the Taders. He has to learn how to survive in the wild, while others around him are dying. His journey takes him down a much different path than Chris’s experience. After making it through some of the most dangerous places on his own, he assumes a fake identity when he is taken to a place where your identity matters. Knowing that he cannot tell the truth about how he got there, he has to be resourceful. Bruce has some interesting experiences with the people at this place, but soon finds himself kidnapped, and is once again off on another unique adventure. 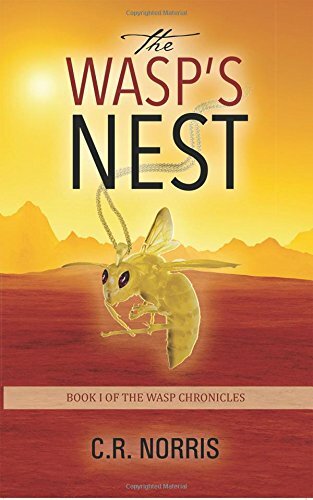 I really enjoyed reading “The Wasp’s Nest” by C.R. Norris. The author has a very creative imagination that takes the reader on a unique journey. Even though the characters are in their teens, adults will also enjoy this story and appreciate the creativity that went into building it. As it is a first book in a series, I am delighted to know that the journey does not end with just one book. Highly recommended reading for all fans of Sci-Fi.